I believe the first full length movie that NHL (now 6) saw on DVD was Curious George. I remember sitting there watching him cry during the sad scenes and laugh hysterically at Geoge’s antics. It was at that moment that we became big George fans. We have dozens of the original books and several from the television show. In addition to that, each of the boys have a George stuffed animal and JSL has a George flannel pillow case. Our DVR is filled with Curious George episodes, plus we own the original movie and soundtrack. 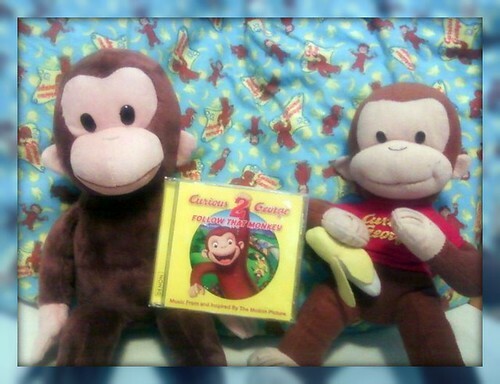 When we were asked to review the "Curious George 2 – Follow That Monkey" CD, I jumped at the opportunity. Thanks to The Family Review network, we received an advanced copy of the CD to listen to. 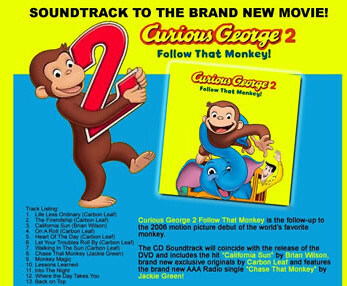 The “Curious George 2″ Soundtrack will be released by the Savoy Label Group on March 2nd, 2010. The Soundtrack features Brian Wilson, Jackie Greene, and Carbon Leaf. The world’s most beloved and inquisitive monkey is back in “CURIOUS GEORGE 2: FOLLOW THAT MONKEY,” the sequel to the 2006 animated hit movie. The soundtrack to “CURIOUS GEORGE 2: FOLLOW THAT MONKEY” features the Rivieras hit “California Sun” performed by Brian Wilson as well as all new songs by Carbon Leaf, a special title track recorded by 429 Records’ artist Jackie Greene and an original score by Heitor Pereira. Extensive retail and online marketing campaigns are planned globally in support of the soundtrack which will be released worldwide on March 2nd to coincide with the release of the DVD. The minute the boys saw the CD with Curious George on it, they demanded to listen to it. We put it on and, within seconds, both of the boys were dancing away. The catchy beat of Life Less Ordinary by Carbon Leaf allows a Curious George fan to picture the little fellow romping around with the Man in the Yellow Hat. My six year old really liked this song and got his brother to do a monkey dance along with him. I really liked The Friendship Song, also by Carbon Leaf. The words are powerful and really tells a story about friends within the song. I am intrigued to see how California Sun is used in the soon to be released movie. I can just picture George getting into trouble at a beach in the warm California sun. Brian Wilson does this a little different than the original, but I love the twist on a classic song. All of the songs leave us anxious to see the new movie when it is released. Both of my boys keep asking when they will be able to see the new George adventure. I know we will be checking it out as soon as we can. Thanks to 429 Records, one lucky reader will be able to win their very own copy of Curious George 2 – Follow that Monkey soundtrack. MAIN RULE – Have you seen the original Curious George movie? If you have, what was your favorite part? 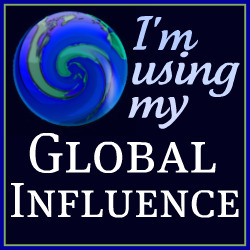 1 Bonus Entry – Leave a comment on any of my non-giveaway posts from the month of January/February. Be sure to leave a comment here to let me know which one. This Bonus entry may be done only twice per person. To enter, please follow the rules above within the comment section. Contest starts today, February 17th, and ends at 10:59 EST on March 4, 2010. You do not have to be a blogger to enter, but must leave a valid e-mail address for me to contact you for mailing address once the giveaway is over. I will select the winner using random.org and contact you via e-mail. You will have 48 hours to claim the prize. If there is no response, another winner will be selected. Open to U.S. residents only. Disclosure: This post was written for Family Review Network as part of a program for 429 Records, who supplied the product for review. No other compensations was given. 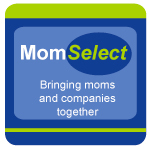 The opinions expressed in the review are my own feelings about the product that our family tried. My favorite Curious George book is “Curious George goes to the Zoo”. No, I haven’t seen the movie. My favorite is still Curious George and the man with the big yellow hat. Thanks to all of those that entered. Winner announcement coming soon!